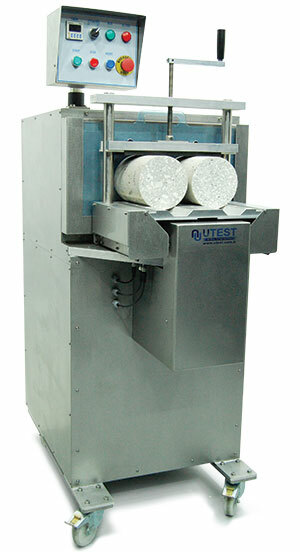 With a new financial year we are pleased to announce of new partnership with Utest Materials Laboratory Testing Equipment. From April 2014 PCTE will represent Utest within Australia and New Zealand exclusively. This move really does make PCTE your one-stop shop for construction materials test equipment. We will continue to be able to service your field testing needs with our comprehensive range, however our excellent range and service will now extend into the laboratory. This post covers the effect upon measured compressive strength various cylinders capping and grinding procedures have, along with examining the use of Impact Echo testing for shallow foundation analysis. The following sections are the extracted findings from the paper “Compressive Strength of Concrete Cylinders by Sulphur, Rubber Capping and Grinding Methods” written by Dimitru et al for the 2009 CIA Conference. The paper discussed the findings of lab tests carried out on concrete cylinders with different capping methodologies and the differences in compressive strengths found. The full paper can be found here on our website. The concrete industry relies heavily on the measured concrete compressive strength to make momentous decisions. The real situation is that no matter how carefully a cylinder is finished, its end surface probably exhibits some irregularities. As required by AS 1012.9, the finished end of a concrete cylinder must be capped or ground before it is crushed for compressive strength. Sulphur and rubber capping are widely accepted methods. However, care must be taken when using the sulphur capping method especially for high strength concrete, where capping thickness of 1-2 mm and adequate strength of capping compounds are required. Rubber capping method is not permitted in AS 1012.9 for testing concrete strength over 80MPa. Alternatively, concrete cylinders can be ground using a grinding machine. Data presented in this paper compares the effects of four types of cylinder preparation methods on compressive strength, including sulphur capping, rubber capping, single ended grinding and double ended grinding. A total of 152 concrete cylinders (i.e. 100 x 200 mm) were used to build as more data as possible for the statistical analysis. These concrete cylinders were crushed as per AS 1012.9 with compressive strengths between 45 and 110MPa. Eight sulphur capped concrete cylinders from the same batch were delivered to the Baulkham Hills laboratory at Boral Materials Technical Services, Sydney. Two cylinders were crushed directly while, for the remaining 6 cylinders the sulphur caps were removed and concrete cylinders were then ground before crushing. Table 1 presents the results. It is noted from Table 1 that concrete cylinders with sulphur capping still gave much lower results and, by contrast, those ground cylinders gave much higher results, indicating the concrete was indeed a S80 grade. Further investigation revealed that the sulphur capping material used was a commercial product, which was designed to test normal concrete rather than the high strength concrete. Therefore, the application of an inappropriate sulphur capping material for high strength concrete gave the incorrect strength values even though there was nothing wrong with the concrete cylinders and the sulphur cap composition. For each strength level, the mean value of sulphur capped concrete cylinders was regarded as 100%. The mean values from other methods were then assessed and presented in Figure 1. In comparison with sulphur capping, when concrete strength is 45MPa, there is almost no difference between sulphur capping and grinding methods. However, the ground cylinders resulted in about 1-3% higher compressive strengths for the high strength concrete. In comparison with sulphur capping, rubber capped cylinders gave about 2% and 7% lower mean compressive strength for 60MPa and 110MPa concrete, respectively. Subsequently, rubber method is not recommended when concrete grades are between 60-110MPa. Concrete cylinders with the double ended grinding method gave the compressive strength values quite constant for all strength grades. When concrete grade is 80MPa or less, single end grinding and sulphur capping methods achieved relatively constant results. The dispersion became more obvious in the case of the rubber capping method. For concrete strength grade of 45MPa, there appeared to be no significant differences between the mean compressive strength of the sulphur capped and the ground cylinders. However, in comparison with sulphur capping method, the ground cylinders resulted in about 1-3% higher mean compressive strengths in high strength concrete. For concrete strength grade of 60-110MPa, rubber capped cylinders gave about 2-7% lower mean compressive strength when compared with sulphur capped cylinders. The dispersion, in terms of coefficient of variation (COV), was significantly affected by the end preparation methods. The double ended grinding method has the lowest COV value of 1.3-1.6%, single ended grinding having a satisfactory COV value of 1.3-2.1%, and sulphur capping having a reasonable COV of 2.1-3.1%. For concrete strength of 60MPa, rubber capping had its COV of 3.3%. However, the COV was as high as 6.5% for concrete of 110MPa and when rubber capping was used. Overall, grinding method can be used for all strength grades for reliable strength results. Sulphur capping and rubber capping methods achieved reasonable results when strength level is lower (i.e. 60MPa). For the high strength concretes, rubber capping method cannot be recommended. Sulphur capping method can be used but the sulphur caping compound must be tested and comply with AS 1012.9 and the capping thickness must be 1-2mm. Otherwise, incorrect compressive strength could be obtained as demonstrated in the case study. In existing structures it can be important to measure the depth and size of foundations to confirm suitability for new loads that will be introduced. New structures are usually well documented, but there are sometimes doubts if contractors do not provide enough information. Impact echo (IE) systems such as Olson Instrument’s Concrete Thickness Gauge or NDE 360 are usually used for flaw analysis and depth measurement down to around 0.5 m penetration. With a change to normal testing procedures, along with changes to how data is processed and interpreted Impact Echo becomes a handy and quick test for foundation depth analysis for smaller foundations of up to 2 m in depth. IE investigations are performed to assess the condition of slabs, beams, columns, walls, pavements, runways, tunnels, dams, and other structures. Voids, honeycomb, cracks, delaminations and other damage in concrete, wood, stone, and masonry materials can be found utilizing the IE method. IE investigations are also able to measure the thickness of structural members. An advantage of the IE method over the Ultrasonic Pulse Velocity (UPV) method is that only one side of the structure needs to be accessible for testing. The IE method will also provide information on the depth of a flaw or defect, in addition to mapping its position in the structure and extent. An impact echo test is usually a strike with a light hammer or small electronic impactor, then an accelerometer or velocity transducer can record the stress wave echoes. The resonant echoes of the displacement responses are usually not apparent in time domain graphs, but are more easily identified in the frequency domain resonance spikes after the time domain data is processed with a fast Fourier transfer. This can be seen in Figure 1. The blue line in the frequency domain data marks a “resonant echo” peak/spike in the test results. Where β is a geometric shape factor ranging in value from 0.8 for a pier/column shape to 0.96 for a slab/wall shape. A slab/wall shape has a single thickness resonance while beam and column shapes have multiple resonances due to their cross-sectional shape. These show as single or multiple spikes in the data. When conducting Impact Echo tests on foundations the major change in the collected data is that the resonant echoes that the system records will be of a substantially lower frequency. To support successful testing changes must be made to the testing procedure. To induce appropriately lower frequency vibration in the foundation a hard strike with a ball end hammer should be used, with different sizes used until on site data reviews shows a suitable resonance. If the impact has correctly introduced low frequency vibrations, then there should be a frequency peak in the frequency graph corresponding to the foundations depth. Select a test location on the foundation, it should be as near the middle as access allows and clear of edges, steps and other similar structural features. Take initial tests using a variety of hammers, ranging from 1kg in weight and lower. Round faced hammers are more suitable to the task than those with a square face. Based upon initial data and using the guidelines in the “Data Processing Procedure” below select the hammer that provides the best data. Commence data collection along foundation, avoiding edges and collecting 5 or more samples in each transducer location. Data is processed similarly to usual impact echo data, but filtering is reduced to a lower frequency high pass filter only. Impact Echo data is displayed as a graph of amplitude vs frequency as seen from two different processing programs in Figure 2. Resonant frequencies inside the structure will be visible as peaks in the frequency graph. The vertical blue or red line in Figure 2 shows the position of the base of the foundation, and above each graph is the thickness measurement. The scattering of data around the peak is usually due to a rough surface of the foundation base. When reviewing this data each peak should be selected and corresponding depth noted. If the lowest of these depths is around the expected depth of the foundation this should be taken as a hypothetical depth and the remaining tests in the same location checked for peaks conforming to this depth. If no low frequency peaks are visible it may be necessary to re-take data for the foundation using a blow with a heavier hammer. High frequency peaks may be due to reflections from foundation walls, inclusions and other sources of sonic reflections in the structure, if they are consistent in each test it reasonable to assume that the data collected is repeatable and therefore a suitable representation of the structures geometry. Patricio has recently joined PCTE as the Sales Manager of VIC Office. With a degree in Industrial Engineering and a sound sales track record, Patricio is a valuable team player of PCTE family. He will specifically looks after the Sales and services in Victoria through maintaining our existing customer networks and developing new market areas. Give Patricio a call or send a quick email now if you need NDT equipment in VIC. 17th to the 19th of September 2014 the Australasian Tunneling Society will be hosting their 15th Australasian Tunneling conference in Sydney, NSW. PCTE will be present at the exhibition with live demonstrations of Geotechnical testing equipment. Drop by our booth to get up to date on NDT and instrumentation for geotechnical solutions and beyond.